“Looking Towards Pte. Michel” – Photo by Steve Mc, used with permission. Visit Steve's flickr photostream. 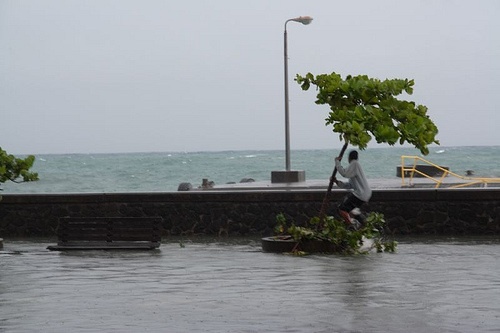 The Caribbean is officially in the midst of its wet season, but many regional territories are battling more than their fair share of sogginess, thanks to the torrential rains that accompanied Tropical Storm Omar – a storm that was soon upgraded to a Category 3 Hurricane as it forged a path through the northern Caribbean. Shortly before approaching the islands as a Category 3 hurricane, Omar's maximum sustained winds had increased to 125 mph, but slowed a bit to 115 mph after moving rapidly away from the islands. 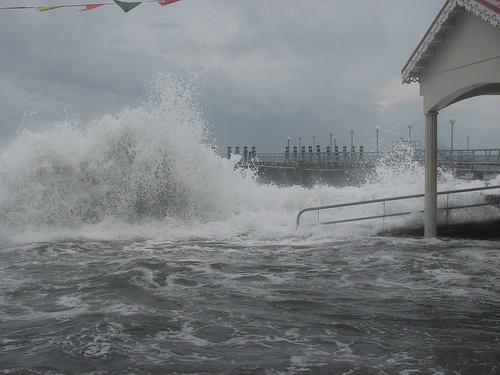 “Waves break on the Roseau Bayfront” – Photo by Steve Mc, used with permission. Visit Steve's flickr photostream. Beautiful weather has returned to the Virgin islands, to judge by a report this morning filed by a Weather Channel meteorologist from Puerto Rico. He said PR got .25 inches of rain, St. Thomas about 2 1/2 and St Croix nearly 5, suggesting St John got something like 3 or 4. LIAT has advised the suspension of several flights as a result of anticipated severe weather conditions generated by Hurrican Omar. Omar is the 15th hurricane formed in the Atlantic during this year's hurricane season, which is supposed to end on Novemeber 30. Storm alerts have been posted for the islands of Guadeloupe, St Maarten, Saba, St Eustatius and St Barthelemy. Luckily, storm-battered Haiti, Cuba and Jamaica have been spared. It didn't rain last night-well not in a manner that was noticeable. 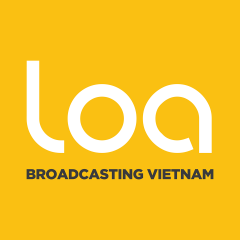 Yet, this morning we awoke to the news that the sea had wreaked havoc in coastal areas and town. 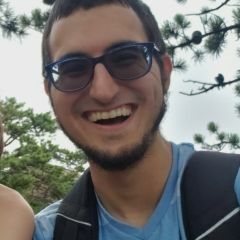 Would you believe we got surges from Omar? On my way into Kingstown, I looked towards the harbour and the Grenadines and saw some angry looking waves and realised that peacefulness had not yet returned. It underlies how really vulnerable we are to natural disasters. In the twinkling of an eye everything can literally fall down around us and we are powerless to stop it. Mother Nature, when not showing her softer side can be one deadly woman that we would be well advised to steer far from. I guess the events of last night are a reminder that we really should shed our lackadaiscal attitudes to disaster preparedeness. 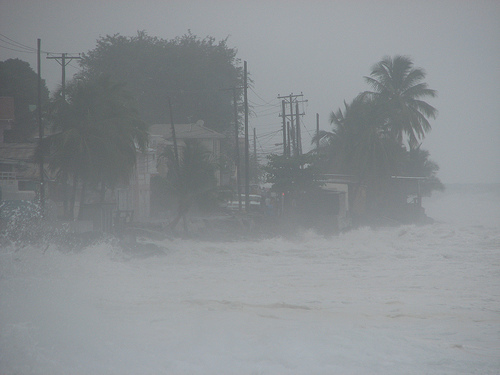 “Tail End of Hurricane Omar, Bay Front Dominica” – Photo by TropicallyTied, used with permission. Visit her flickr photostream. “Pte. 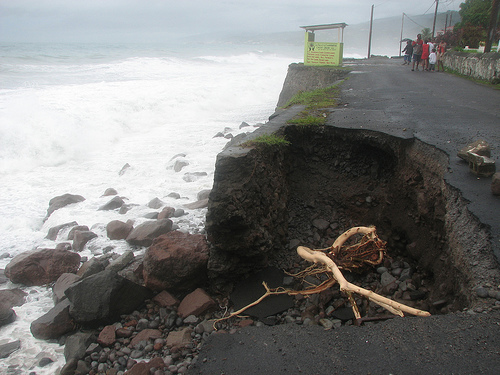 Michel Road after Hurricane Omar” – Photo by Steve Mc, used with permission. Visit his flickr photostream. Miraculously, though, Omar seemed to have wreaked much less havoc than his 2008 Hurricane Season predecessors. His bark was worse than his bite – soon after threatening the north-eastern Caribbean, Omar weakened back to the level of a Tropical Storm.